Tourist specials Blue Train and the Pride of Africa are continuing the tradition of the African de-Luxe trains of the past, unrivalled by any other train on earth. 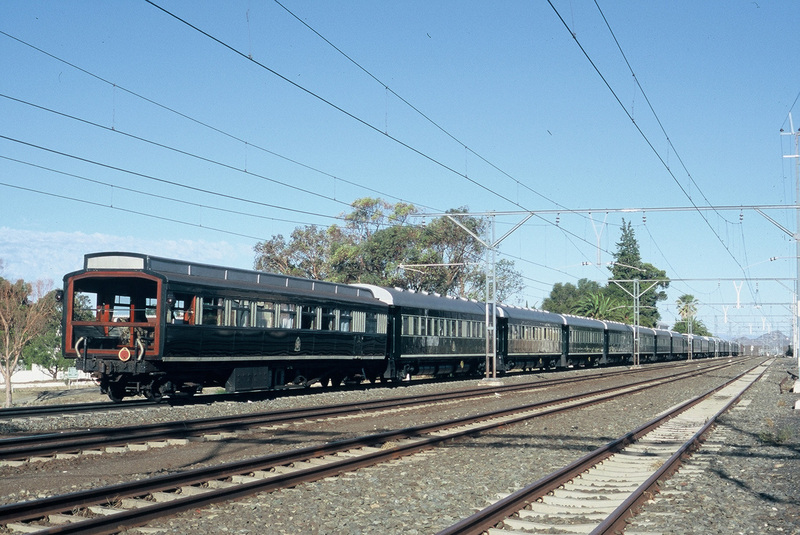 Blue Train and Pride of Africa became the only expresses which connected the Cape with the Victoria Falls. The Pride of Africa by Rohan Vos even is the only train which ever did run from South Africa to Dar es Salaam in Tanzania -- via the TAZARA railway, built by Mao's China! 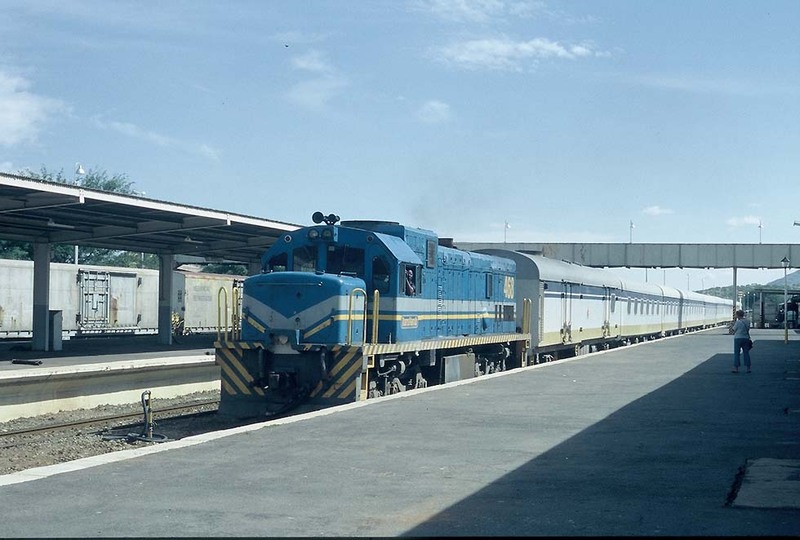 The first trip started at Dar es Salaam in 1993, after the train arrived empty from South Africa. On the TAZARA it was hauled by the light-blue/cream colored Krupp diesel DE1011, between Victoria Falls and Bulawayo by the Garratt 417 and near Pretoria by Rovos' green class 19D steam locomotive. In 2005 the train to the Victoria Falls had been temporarily stopped at Pietersburg, South Africa, where the passengers took Rovos' historic Convair prop plane for a flight to Zambia. From Lusaka, Zambia, steam tours to the Victoria Falls were offered. With the voyages to Dar es Salaam the Pride of Africa is now the sensation of TV reports, the most exotic train of the world. Namibia's Desert Express of 1998 is the third de-Luxe special in the southern part of Africa and the only one in a modern "African" style, built in Namibia and created by international designers, mainly Anja Krenz and Karl-Dieter Bodack of German railways as consultant. The General Electric engine 50B was specially refurbished for this train. In 2006 Alby Glatt's agency Pullman Club offered an international Desert Express tour Swakopmund - Windhoek - Upington - Kimberley - Matjesfontein - Cape Town. Cars built in 1972 by Union Carriage & Wagon Co. for the (regular) Blue Train. 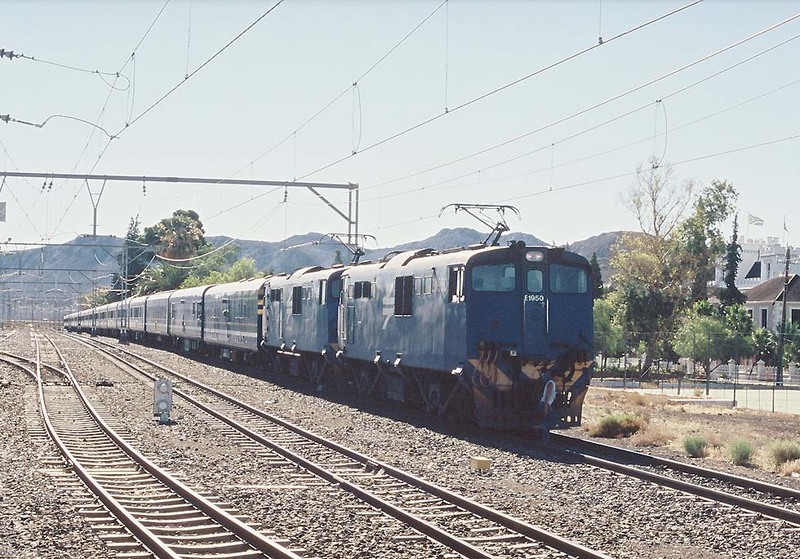 Two GM diesels De Aar - Kimberley, electrics Kimberley - Pretoria. Colors: Dark blue, white line; locomotives blue. Most cars built by Union Carriage & Wagon Co. towards the end of the '30s for the best trains. Colors: dark green/cream; locomotives by Spoornet, orange. At Pretoria, Rovos uses own steam locomotives, a class 6, three 19D and the oil-fired 25NC 3484. Cars built in 1998 in Namibia. Colors: light grey with yellow and dark blue, locomotive light blue with yellow. Less formal "Rail Safaris" in South Africa with normal sleeping-cars are undertaken by the "Shongololo" special, created by George Milaros, who started also the "Ozback Explorer" in Australia.